You’re rushing, it’s raining and the supermarket car park is unbelievably packed. You’re only popping in for a couple of things. You’ll be a few minutes max, but there’s nowhere to park. Then through the drizzle you spot it, an empty space tantalisingly close to the entrance. It’s a disabled bay, but you’re going to be really quick. Surely it won’t matter if you park there just this once? Carrie’s a busy woman. She’s a single mum, works part-time and has a 14-year-old son called Tom. Tom’s a great kid – cheeky, alert, loves his iPad like most 14-year-old lads. Except Tom has cerebral palsy and this affects him physically. He can’t walk; he can’t talk and he has very limited mobility. Carrie and Tom had stopped at a supermarket on their way back from a trip out. The car park was really busy, but there was plenty of parking available on the street nearby. However, Carrie can’t park on the street because Tom accesses the car via a ramp at the back, and she’s been blocked in too many times to chance it happening again. She eventually found a narrow spot in the far corner of the car park. The kind you’d avoid in a Matiz, let alone if you drive an adapted vehicle that Carrie describes as a van. So why had someone without a blue badge felt she needed that disabled spot so badly? And why did she get so angry when she was challenged? The conclusion Carrie came to was simply this – inconsideration. We all struggle as parents sometimes. Tantrums in shopping centres, juggling work, school and play dates, unexpected bouts of sickness at awkward times. Undoubtedly, there are times when parenting is difficult for everyone. However, for parents of children with disabilities it’s even harder, with so much more to organise for just a quick trip to the shops. For Carrie, life isn’t just a matter of managing work, school and after-school activities, she has a diary of appointments that she needs to keep track of. Tom’s condition requires regular visits to a dietician, physio, and neurologist, amongst others. Plus, he needs surgery every so often to help keep his muscles straight. The logistics of going out are fairly mind-blowing too. Tom’s condition requires equipment such as feeding syringes (Tom is PEG fed) and neckerchiefs to keep his clothes dry. They try to stick to places close to home because changing is a big issue. Carrie needs to check that places have a private changing area with a change stretcher, and ideally a hoist as it takes two people to lift Tom now. But when we spoke, Carrie wasn’t complaining. She described their situation very matter-of-factly and was upbeat. She hardly grumbled, apart from when she spoke about people who take up parking spaces they’re not entitled to. So next time you’re in a rush and tempted to take that spot, think about people like Carrie and Tom. They already have plenty to deal with, without losing one of the few perks that make their lives just that little bit easier. I totally agree. My nieces is wheelchair bound and my sister drives a ‘van’. Even with this awareness I would never park in a disabled spot. Thank you for posting this. My husband is disabled and it is very hard for non disabled people to understand. I can only imagine how difficult it is to have a disabled child. 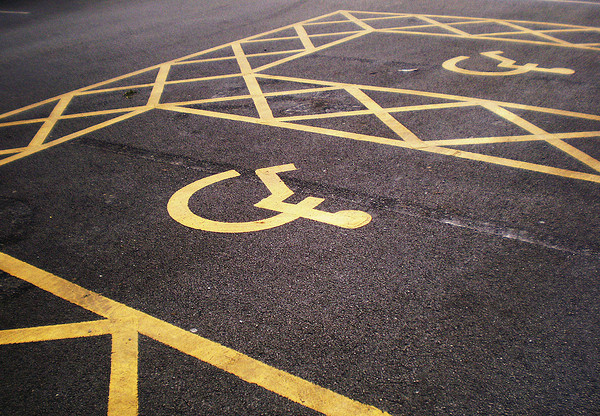 The UK should adopt ticketing of disabled bays. People abuse them far too often and don’t care. There are generations of people that don’t give it a second thought. I can’t bear the thought of being anything other than kind to a disabled child, or any child for that matter, but some people are so self centred. In the US, if you park in a disabled bay, even in a grocery store car park, you get a hefty fine and it should be the same out here. The attitudes are what really sting, though. It is so backwards. I agree with Dawn, those who park in disabled bays should be fined. Same with parent and child parking – very very irritating and so selfish and lazy of those who abuse the spaces. I agree. You see it all too often, especially if you go to the supermarket first thing in the morning when white van moron…sorry, person, seems to take every space by the doors. Same applies to parent/child spaces. Yes, they are wider and nearer. Try juggling a toddler and baby in a carrier along with a trolley and you’ll realise why. I am fortunate that I, nor any of my family, are truly disabled. My mother-in-law has a Blue Badge because she has terrible trouble walking due to her stents and Leukemia but they still rarely use the bays as their approach is “someone more needy may want it”. Amazing huh? And yet someone who walks perfectly well will take one. Inconsideration. You are so right. Great awareness post (not that those who take the spaces are ever likely to read it). It’s truly shocking that able-bodied people park in these spaces out of plain laziness and inconsideration. I would have struggled to keep my composition as your friend did. Thanks for raising awareness with this post. this irratates me soo much. I have 2 children with autism and need to be near the entrance incase we have a bolter!!! Our local tesco car park is the worst for it, you can never ever get a space in the disabled or parent and child spaces. There always full and not by people who should be using them. Couldn’t agree more, I get fed up with childless people parking in parent and baby spaces so I can only imagine the frustration of disabled people when those who aren’t disabled park in disabled bays. It’s so selfish, I wouldn’t dream of doing it! You’ll be pleased to hear this is something I never do and never will and I feel very much for Carrie and Tom as a mum of twins for me the children’s bays with larger areas to open doors were crucial to my supermarket shop, juggling 2 babies into a trolley can become a nightmare and my blood would boil when I saw others abusing these places. I did try saying something to the two men sat in their work van eating sandwiches feet on the dash and radio blasting out, but they didn’t care and were not going to move. The time I mentioned something to a woman with no kids I got a right mouthful back and so never said a word again. Aww, so sad your friend and her son had to experience that! 🙁 It’s very important for us to be considerate of others. I really hate it when people do this. And to shout and holler at the person who’s right it is to park in the space is really rude. they’re only shouting because they know they are in the wrong. I doubt it will make them change their habits though. Some of these people need to see what life is like navigating the world with a disabled child, that would change their habits. I feel for Carrie in this situation. The disabled bays are there for a reason. My Nan is now registered as disabled as she can barely walk without assistance. I get so annoyed at people who abuse these facilities and to then have the cheek to be abusive is beyond comprehension! Thanks for trying to raise awareness and remind everyone that they are there for a reason! I’d never park in a disabled spot. Really shocking, A classic case of being defensive because you know you are wrong. Shame on then! Some people are so inconsiderate and then have the cheek when questioned about their wrongdoing to mouth off as if you are in the wrong for bringing it up. I feel the supermarkets should do something about it. I wish people would have a little more respect and consideration for others.